2007 seems to be the year the square driver will take over. Big names in the golf industry such as Callaway and Nike have pushed square drivers on the market and the logic behind shifting weight to the back corners does makes sense. This leads some to believe that the square head will be the standard for all drivers in the not to distant future. With all the hype and foresight, it's easy to overlook the more traditional drivers from companies like Titleist. In April 2007, Titleist followed up on their 460cc 905R with the fairly traditional 907D2 and the triangular 907D1. Both designed for the better player and neither at all resembling a square head. 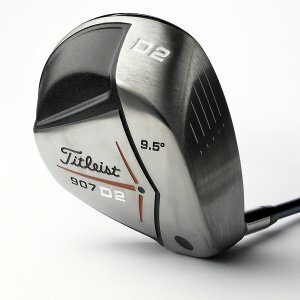 The 907 line continues Titleist's "two-driver" strategy. The 907 duo, like the 905 and 983 lines before it, continues Titleist's history of all-titanium clubheads. The 907s feature a 6-4 Titanium body with an SP700 beta titanium face. On both the D1 and the D2, the thickness of the beta titanium face is tapered from a thinner top to a thicker bottom, leading to more optimal launch conditions across the face - high launch, low spin. Like the 905 (S, T, and R models), the 907 drivers both feature an aluminum bore-through hosel and sleeve that better marries the shaft to the clubhead. Unlike in the 905 series, the 907 hosel sleeve is threaded and screws in, eliminating concerns of clubmakers and avid golfers that they could accidentally pull the hosel sleeve when changing shafts. The buzz word with drivers this year is, as mentioned earlier, MOI. These three letters stand for "moment of inertia" and the higher a club's "MOI," the less it will twist when a shot is struck off-center. MOI is measured in two directions: horizontal (heel/toe) and vertical (high and low on the clubface). As a general rule, higher handicap players mis-hit shots on the toe and heel, while better players miss high and low. The Titleist stock ProForce is the 75, a 76-gram shaft weighing nearly 10 grams more than the UST ProForce v2 65 (67 grams) that most other companies will stock by default so beware the difference if you're coming from another company's driver with a ProForce v2 shaft. The 907D2, while an evolution of the 905R, is an evolution forward as well as towards the middle of the S-T/R line. It spins less and launches higher than the 905R and, from what I can tell, performs like a larger, more powerful, and more forgiving 905S. All told, these drivers are really impressive. The symmetrical face, the Titleist sound, and the incredible distance, workability, and forgiveness afforded by this driver astounds the golfer every time it is pulled from the bag. Titleist puts a lot of emphasis on PGA Tour validation, and the 907 drivers are no different. Jason Dufner and Tag Ridings are playing the 907D1. The 907D2 is in the bags of Bens Crane and Curtis, Luke Donald, Brad Faxon, Bill Haas, Arron Oberholser, Mark O'Meara, Tom Pernice, Jr., Brett Quigley, Adam Scott, and others. Both the 907D1 and 907D2 offer incredible distance with fine-tuned amounts of forgiveness and workability. If you're a single-digit handicapper or a good driver of the golf ball, track these clubs down at a demo day. Odds are, one may make its way into your bag.